The WOMA team recently had a reason to celebrate, the 10th anniversary of the company. Since April 2008, the company has been supplying the brush industry with used machines both for woodworking and for the production of brushes, brooms, paintbrushes, paint rollers, mops. Including special equipment, for example for technical or medical brushes. Focusing on the international market right from the start, founder and company owner Daniel Köhler has developed his company from a one-man business to a professionally positioned company. On average, about two employees per year were added, so that today about twenty employees take care of the needs of customers. In addition to the two women in the office, around fifteen professionals work on the machines in the workshop. "In the beginning we only cleaned and resold the machines. 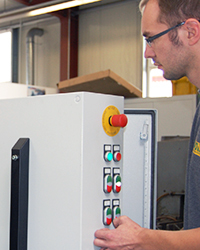 Today, we can realize complete overhauls with new CNC control." Daniel Köhler explains the development of recent years. Furthermore, of course, machines are only bought and sold again. But the demand for the "full service" is rising steadily, according to the entrepreneur. He himself had even trained as a machine construction engineer, which he considered even ten years ago to be impossible. He and his wife are especially proud of the new location in Bad Salzungen and their "mixed” team. "We have everything here, from the farm mechanic to the lumberjack." Smiles the boss and says about the move to the 1,500 square meter building, that he was especially concerned to improve the working conditions for his employees. "And by the way, we quadrupled our storage space. As a machine dealer, you simply have to have space." 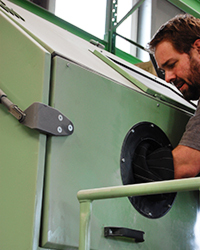 With the enlargement, Daniel Köhler also made room for his second business idea, the new machine construction. "However, enlargement also means more responsibility - towards employees and customers. In order to do justice to this, my wife and I work a lot, but also absolutely gladly. Brushes are an exciting topic that we will hopefully be with for many more years" concludes Daniel Köhler his retrospect. Our machine warehouse, our competencies and thus our team are growing continuously. 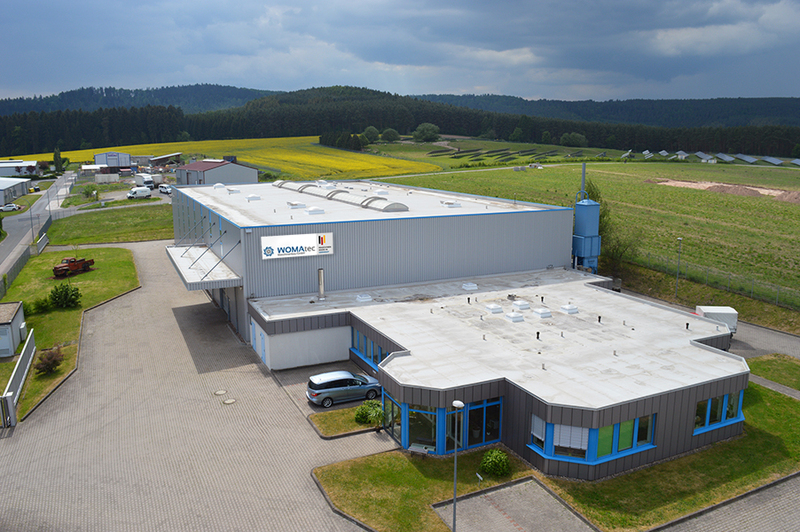 After nearly ten years of company development, the capacities of our first location in Stadtlengsfeld were exhausted. 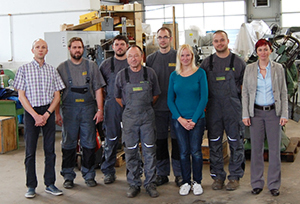 Above all, the foundation of the second company, WOMAtec Maschinenbau GmbH, which exclusively deals with the development, planning and production of new machines for the brush and wood industry, necessitated an expansion of the workshop and office space. 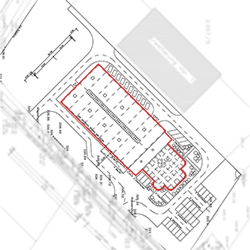 An extension at the Stadtlengsfeld location would have been possible, but requires lot of time and manpower. That is why Daniel Koehler decided to buy a finished warehouse, whose location, building fabric and spatial conditions are optimal for us. After minor renovations and alterations, the premises were ready to move in just a few weeks. 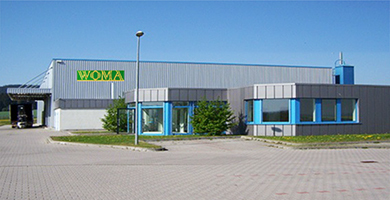 Since 1st March 2017 the companies WOMA Wood Machinery and WOMAtec Maschinenbau GmbH are now located under the roof of a 1.500 sqm industrial hall in a modern industrial estate in the district town Bad Salzungen. 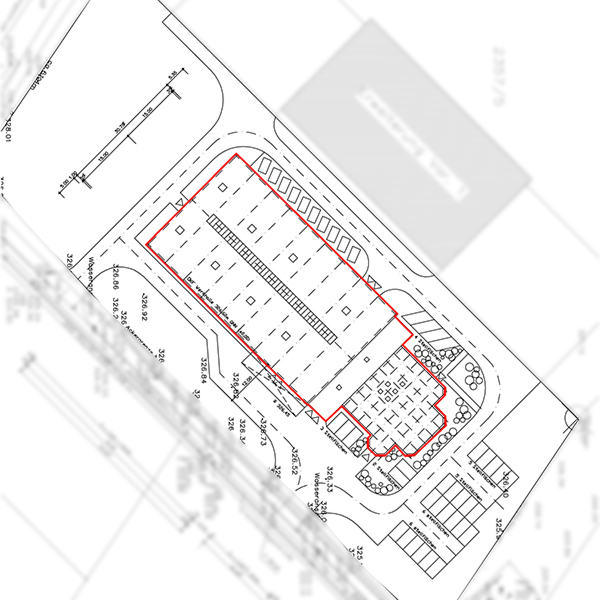 Not only the fortified yard with lorry tarmac and parking lots is a relief for employees, guests and suppliers. Above all the generous workshop area offers optimal conditions for works such as turning, milling, polishing, drilling, welding as well as for the assembly of new machines or repairs on the used ones. In a large painting room machine frames, covers as well as small parts can be pretreated and painted. The own sandblasting system is the ideal supplement. In the approx. 1.000 square meter machine warehouse all used machines are now available and can be easily reached and viewed by customers. In addition to the social rooms, the office space offers bright and friendly spaces for the field of sectrection, sales, construction and workshop management. Digital Highspeed and, with a view to the beautiful countryside of Werratal, our employees will be pleased to answer your inquiries. We also look forward to every visitor! For the first time in the WOMA history Daniel Koehler needs to retire one of his workers. 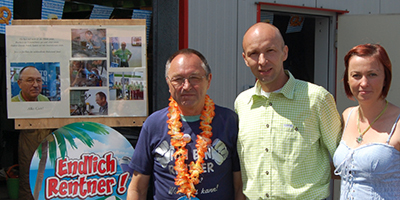 Gerhard Schlegel from the neighboring place Weilar has earned-well his pension after 45 man-years. Four years he was part of the WOMA team and will further be - in a mini job. As experienced mechanic he could teach the youngsters still a lot. In honour of Gerhard's retirement WOMA was celebrating a great barbecue. In 2014 WOMA was able to do some investments again that will benefit both our employees and our customers. Thus four new employees were hired enriching our now ten-strong young team. Among our new workshop manager Mr. Sembritzki, two more mechanics and an office assistant. Thanks to the high qualifications of our professionals, the company WOMA could significantly improve their skills particularly in the workshop area. From now on our day-to-day routine includes as repairs and overhauls just as cleaning, inspection and packaging of the second hand machines. Even new control systems are designed and manufactured, so that a nearly-new machine is created during a complete overhaul. In addition our mechanics are travelling worldwide for machine dismantling and loading. For extensive machine overhaul and manufacture of spare parts company owner Daniel Koehler invested in new workshop equipment. 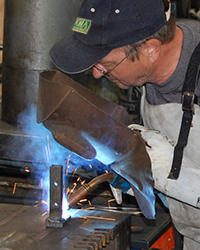 With the existing metal working machines and tools can be performed almost all the necessary works in-house. This also includes welding, sandblasting and painting. For special parts or services such as hardening, burnishing, powder coating or wire EDM we cooperate closely with highly qualified suppliers from the region. Not only in the conditions in the workshop were optimized. Our sales department is housed in the new office building since November 2014. From here annually about 100 machines find a new owner. Global sales, purchase of used machines as well as the associated logistics are organized by sales manager Maria Kohler and assistant Nadine Mehne. Inquiries from all over the world can be handled quickly and easily thanks to the latest communication and PC technology as well as extensive language skills and years of experience in import and export . The year 2015 is already dominated by the international exhibition INTERBRUSH, which will take place in April 2016. 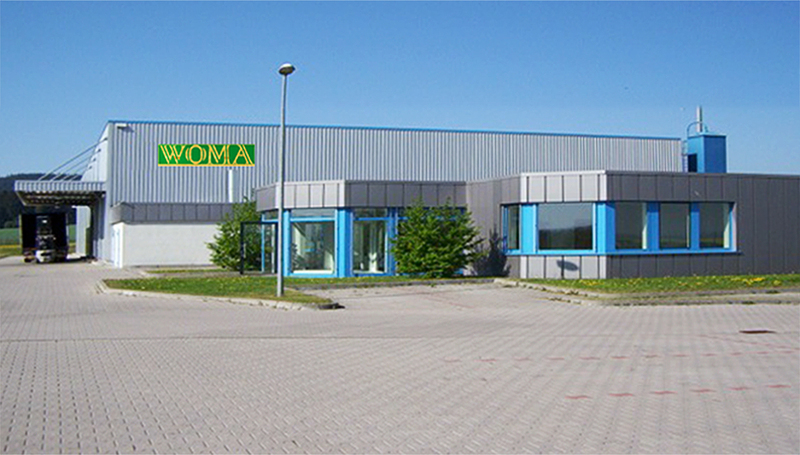 As part of our fair participation we will present our customers the latest developments in the company WOMA. You may be curious. As a worldwide acting machinery dealer it is very important to keep the international terms for wooden packaging according to ISPM 15 rules. That means, we are only allowed to used IPPC timber for sea freight crates and container packaging. To guarantee this standard, we are purchasing heated IPPC squared timber and pallets from certificated German suppliers. These get marked by our own branding stamp. For sea crates we use plywood plates which also correspond to the ISPM 15 standard. For save arrival of the machine at your place we prepare it for its long trip over the sea. Safety packed under foil flash rust has no chance. The base of our sea crates is constructed of several pallets fixed with a strong plate. On this plate the machine is screwed tightly. The edges of crate are hightended with squared timber. Each connection is screwed to be as strong as possible. For container loadings we use IPPC wood of course too for fixing each package. At loading we take care on good unloading conditions at your place. Strong belts ensure the safe arrival at port of destination.